I am so honored to have my good friend Bill Treasurer join us this week for a guest post. Bill opened doors for me as a first time author and continues to challenge me to be my best. He is the author of the newly released edition of Leaders Open Doors, one of my favorite books about leadership. It is short, powerful and filled with stories and applicable actions. Successful introverted leaders consistently demonstrate the four factors Bill beautifully describes below. And true to Bill’s nature, he is donating all the proceeds from the book to programs that support children with special needs. Einstein knew that opportunity has always been life’s most powerful motivator. People will move mountains for a leader as long as moving the mountain provides them with enriching opportunities. It’s in the pursuit of opportunities that people can try themselves, test themselves, better themselves, and even find themselves. A big part of a leader’s job is to provide people with opportunities to grow, progress, and evolve. Leaders have to be opportunity-creators. Think of a leader who has made a positive impact on your own career or life. Pick someone you actually worked for, not someone on the world stage. There’s a good chance the leader was someone who gave you an opportunity to prove yourself to yourself. The leader likely included you on opportunities that were exciting to pursue and helped you sharpen your skills in the process of pursuing them. Finally, the leader likely stayed involved by guiding, coaching, and supporting you too. Know Your Employees: Be knowledgeable about the backgrounds, needs, and desires of your employees. Ask them directly about their career goals and aspirations. What do they want to get out of this job? Envision the Desired Results: Have a clear picture of the desired benefits that given opportunities present for the employee and the organization. Do some “future-casting” with your employee, thinking through the potential benefits that could be gained if the opportunity is successful. Also identify the actions that will maximize the probability of success. Provide Ongoing Support: Genuinely want, and support, your employee’s success. Stay involved by periodically asking what support they need from you, removing barriers that might block their progress. Offer encouragement and guidance when they meet roadblocks and bottlenecks. When you really know the aims of your employees, when you’ve assigned them to juicy opportunities that are ripe for their skills, and when you’ve worked with them to develop a clear picture of a successful outcome, you can’t help but take a strong interest in their success. And when your people are successful, you’re not just an effective leader, you’re an opportunity leader! 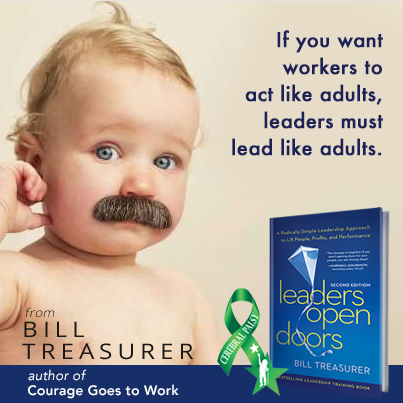 Bill Treasurer is the Chief Encouragement Officer of Giant Leap Consulting and author of Leaders Open Doors, which focuses on how leaders create growth through opportunity. 100% of the book’s royalties are being donated to programs that support children with special needs. Bill is also the author of Courage Goes to Work, Right Risk, and Courageous Leadership, and has led courage-building workshops across the world for NASA, Accenture, CNN, PNC Bank, SPANX, Hugo Boss, Saks Fifth Avenue, and the US Department of Veterans Affairs, and many others. Contact Bill at btreasurer@giantleapconsulting.com, or on Twitter at @btreasurer. This entry was posted in Jennifer Kahnweiler on October 6, 2014 by Jennifer Kahnweiler.